The Man With the Hands? I Married Him! ... in a sunny wildflower meadow, surrounded by the love of close family. EIGHT YEARS We've been a couple for eight years. But here on Kitchen Parade and A Veggie Venture, until now this wonderful man was mentioned only in sly hints. I called him "my favorite cook" or "my kitchen companion". Mostly though, he wasn't named at all but instead appeared only as the "Man with the Hands" in food photos. (It's true. See here or here or here). EIGHT DAYS And then we took all of eight days to get married. 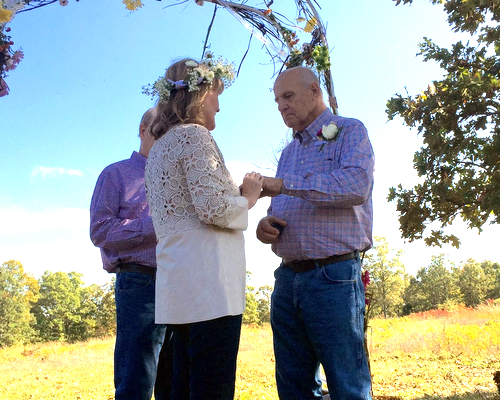 EIGHT WEEKS ago today, the Man With the Hands and I were married in a golden October meadow, officiated by a dear friend and witnessed by a small circle of family. So Meet My Man with the Hands. But do call him Jerry, I do. He's a lawyer with his own firm, a father of three and devoted grandfather of six. He comes from humble family beginnings here in Missouri and is the patriarch of a large, extended family. He's a Marine and a "genuine American college football hero". He's brilliant and funny, a storyteller who quotes poetry and music and books and movies. He paints and reads voraciously, grows vegetables and wants to raise chickens. He makes me think. He inspires and encourages me. He softens me. He makes me laugh, oh my how he makes me laugh. And yes, he cooks! WE cook. 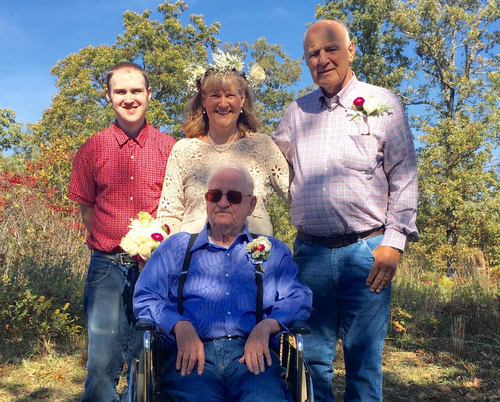 My 90-year old father was present for the wedding, all duded up in new jeans and shirt. He's lived with us since March so when we married, Dad became Jerry's "ex" common-law father-in-law. Ha! My nephew Alex drove from Texas to represent the family. Bad timing, my sister Adanna was scheduled for surgery just a few days before so she and her husband were unable to make the long trip. I missed my sister so much but thanks to Skype and Alex's video of the ceremony, she and Ted were able to be present in spirit! These guyzzz may not look so impressed by all the fuss but had important jobs and took them seriously. The oldest was the "ring leader" and the younger twinzz were the "ring bearers". On their own, they made up a jazzy dance to deliver the rings! So apt! We are working on plans to build a home in this very meadow! We were a little surprised – taken aback, even – at the outpouring of joy and support from family and friends. Let's start with these two, long-time friends Dennis and Chris. When Dennis was a city mayor, he got himself a license to marry people. Since we don't currently have a church home, talk about luck, having a friend, a real friend, able to marry us. It was so meaningful. Dennis also wrote our wedding vows – even a pair of wordsmiths like Jerry and me couldn't improve on them. And then there's Chris. WOW. Four days before the wedding, Chris asked what she could do to help. "Hmm, maybe make rice krispie treats for the kids?" I wondered out loud. 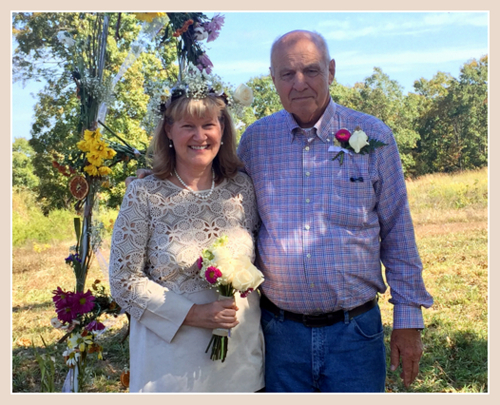 Instead, Chris took it upon herself to create all the "pretty" in the wedding, the wreath for my hair, the boutonnieres for Jerry and my father, the autumn flower arbor, the beautiful tables for the after-wedding lunch. She worked like crazy to make our wedding day extra-special for us. And it was, so so very special. Truth be told, I've had writers block for eight weeks, unable to express our thanks for the enormity of the gifts given by Dennis and Chris. Some times "thank you" just isn't enough, even when it's from the bottom of your heart. But then? Our friends Huck and Mary hosted a dinner for us at their club. And our friends Dale and Sharon took us for a lovely dinner and we're now making salads in an enormous, hand-carved wood bowl, so perfect for us. A niece and nephew gifted us a Japanese steel-carbon knife, whoa, talk about sharp, it's perfect for cutting thin-thin slices of our house-made gravlax. And in January, our friends Charlie and Jan will host a brunch at the Piper Palm House. Tom and Anne, the couple who introduced us, keep reminding us there's champagne waiting on ice. These meaningful friendships, we find ourselves both moved and overwhelmed. We are Tom and Anne's "second marriage" – that is, the second couple to meet beside their pool. Their "first marriage" makes us wonder about unlikely coincidence. You see, she was an exchange student to Finland (as was I), he was a widower (as was he). Despite all the fireworks, he didn't remember my name and needed help locating the Fourth of July party's "green bean casserole lady" – yes, the amazing World's Best Green Bean Casserole. We fast realized that I'd already met his granddaughter a year and a half earlier. In fact? Get this! She was even featured on A Veggie Venture, the sweet girl with glasses on the right pictured with "Wonderful" Glazed Turnips & Carrots. Today E is a poised, confident young woman thinking about where she'll go to school – and along with her five boy cousins and brother, a great joy! On our first date, I mentioned that I'd been wanting to buy a whole pig. Without hesitation, he responded, "When you cook a whole pig, you have to be really careful to get the temperature up between the shoulders." All of a sudden, I realized I might be in for a ride. Me? I'd just wanted to have a butcher cut up a pig and wrap it in plastic. This man? He's cooked more whole animals than many chefs. A few weeks later on our first trip, he surprised me with a bronze pig we call WH Hog (Whole Hog, get it?). While I wandered through a sculpture gallery, he managed to buy WH and arrange for shipping, all without my knowing! We're so modern! We shared our happy news with close friends and extended family by text and email! Friends ask, Does it feel different? In some ways, no. We chose to spend our wedding night at home. Of course! In the morning, there was PopPop's Famous Bacon and Ms Alanna's best pancakes to cook for grandchildren! That's just us, who we are. But then again? The Man With the Hands now wears a gold band on his left hand. So do I. Our vows feel sacred. I feel treasured and protected in a new way. Mornings, I look at him and feel anew how extraordinary is the altogether ordinary institution of marriage. Evenings, when I think back through the day, it's heart-warming how he figures in so many "highs" and so few "lows". When I kiss him good night, I whisper, "I love you." Then in a sort of silent prayer, I remind myself, "We are so lucky. So lucky." Congratulations - so happy for you two!! Wishing you many-many happy years together! Congratulations!!! I wish you many, many happy years to come. May you both have much love, good health and endless love. God bless you and Jerry! What a heartwarming story. Thank you for sharing it. and wishes for continuing happiness. CONGRATULATIONS...you look so happy and I am delighted that you shared your story with all of us AND I too finished with tears in my eyes. Much happiness to you both, and I LOVE WH Hog...a guy who buys that for you is special indeed! 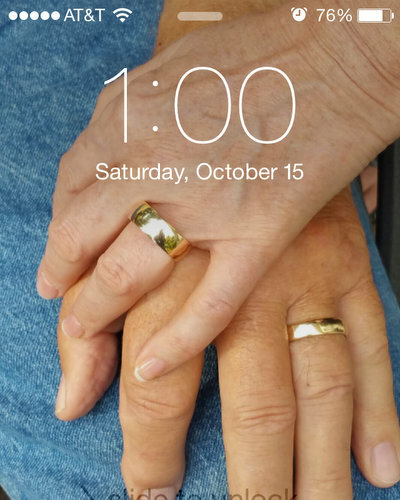 Congrats and much happiness--thanks for sharing your joy. What a beautiful story, Alanna! Congratulations to you both! Congratulations! May you have a blessed and wonderful life together. Congratulations, wishing you both a lifetime of happiness and healthy cooking! Congratulations Alanna and the Man with the hands! Such a beautiful story. Wishing you many happy years and best cooking together. Regards Finnish Minna from Dubai desert. Congratulations to you! Hope that you have many more wonderful years together! Thanks for sharing this. Best wishes for many years of joy together. Congratulations, Alanna and Jerry- and wishing you every happiness! Alanna, you make a most beautiful bride. Simply radiant! Congratulations! I loved reading your happy story! Thank you so much for sharing! Congratulations!! I wish you many years of happiness. Alanna, congratulations to you and Jerry! So happy for you! And that photo of your shadows on the path is absolutely gorgeous. I thought it was a painting at first. May your life be as warm as your columns. I am so very happy for your happiness!! Beautiful wedding! This is wonderful news! I'm really happy for you and Jerry and wish you Health and Happiness and a lovely long life together. Good wishes Alanna on your marriage, your touching story brought tears to my eyes, I do try to read every post of yours and the one on growing garlic made me think why not try it out and then I saw the way you described your eight day wedding. It is truly wonderful to find someone with the same interests at yours. God bless and many more wishes to you both.From sunny India.